Mothers around the world are waking up to cards, flowers and gifts, maybe even breakfast in bed or taken to a brunch buffet in an effort to show how much they are appreciated by their children. Unfortunately my Mom won’t be getting these things this morning. That’s because she lives 692 miles away and she already got her flowers on Friday. But even if I were close enough to do any of the other things I mentioned, it wouldn’t be enough for the woman who gave birth to me nearly 39 years ago. Truth be told, there’s nothing I could do that would even come close to showing my Mom how much she means to me and how much of an influence she has had in my life. My Mom and I had a falling out during my senior year of high school, because of my stubbornness, and I moved out of her house. While we spent a year at odds with each other, it turned out to be the best thing for our relationship. It was until after I moved out of the house that I realized just how much my Mom had sacrificed so my sister and I wouldn’t do without. I won’t bore you with all of the details as to what makes my Mom so great. I’ll just say that I shutter to think about where I’d be if it weren’t for my Mom’s love, help and guidance over the years. I know I don’t say it enough and will never be able to come close to paying you back for everything you’ve done for me, but I love you and miss you. 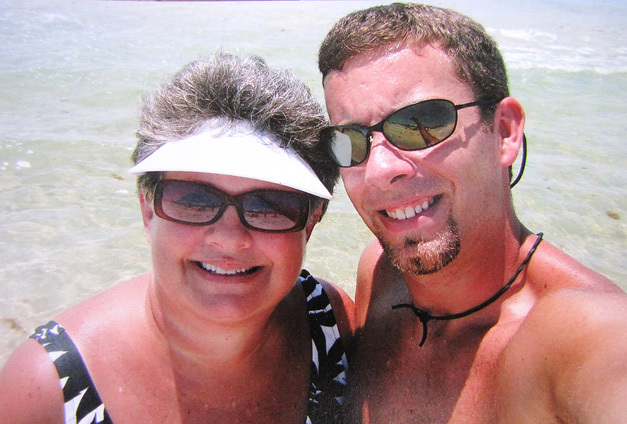 Mom posing with me on the beach down in Gulf Shores, Alabama. Gallery | This entry was posted in Daily Life and tagged daily life, family, humor, Mother's Day. Bookmark the permalink.